Propane tanks cannot simply be trucked away when you’re finished with them. For safety reasons, the National Fire Protection Association’s standards for storing and handling propane states that ASME containers cannot contain more than 5 percent of their capacity during transportation. To reach this level, your propane supplier can pump out the propane, for a fee. Alternatively, you can just burn off the fuel. The next step is to disconnect valves and break down piping between propane tanks and heaters. Or, if you are using natural-gas heaters, plumbing needs to be disconnected. Babfar is not responsible for disconnecting fuel lines. So, you will need to have your plumber or propane supplier do this before we arrive to collect the heating units. Similarly, have your electrician safely terminate electrical connections. Typically, this involves shutting off breakers, disconnecting hard-wired lines, and putting lockboxes on panels. Contact Babfar to schedule a pickup as soon as heaters are disconnected. As propane suppliers and electricians may take time to get to the site, please wait until units are disconnected before calling Babfar. Assemble ductwork, don’t scrap it! Your rental likely includes ductwork. So don’t scrap it! You may incur a charge if ductwork is not returned. Instead, when you disconnect ductwork, break it down. Remove the sheet metal screws and elbows. Place the resulting 10’ spiral sections together, as they were when they were delivered. This will ensure that equipment can be quickly packed on our truck and minimize interference on your site. 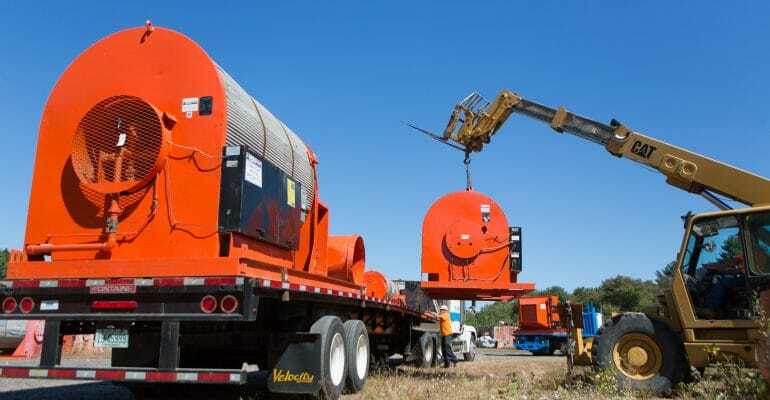 To ensure we have clear access to equipment on loading day, move heaters and ductwork to the site’s perimeter. A telehandler forklift rated for the weight of your heaters (Please reference http://babfar.com/models/) can move equipment to the side. Having unobstructed access to the equipment will minimize disruption and delays, once we are on site for pick-up. Get ready for loading day! Contractors are responsible for loading heating equipment to our truck. So, make sure you have the equipment needed for the scheduled pick-up day. The forklift used to relocate equipment (above) will work. Before we arrive, make sure you have clear access to the equipment. Relocating barriers, construction materials, and other items will prevent delays. Babfar will schedule pick-up as quickly as possible—typically within a week or so of your call. A little preparation before will ensure everything on loading day runs smoothly and save you valuable time and money!